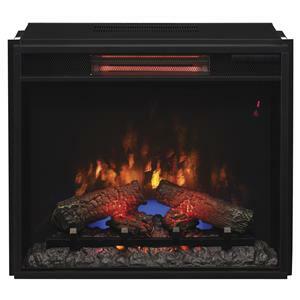 Features Spectrafire Plus Customizable Flame effect: 5 flame effects, 5 flame speeds, 5 brightness settings Warms up to 400 square feet Safer Plug Fire Prevention Technology™ Traditional log set and ember bed (Available in all sizes) Contemporary translucent fire glass ember bed Flat, tempered glass front display Digital thermostat automatically regulates room. 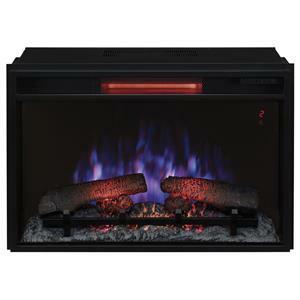 The Fireplace Inserts 26" Fireplace Electric Insert at Morris Home in the Dayton, Cincinnati, Columbus, Ohio, Northern Kentucky area. Product availability may vary. Contact us for the most current availability on this product. Browse other items in the Fireplace Inserts collection from Morris Home in the Dayton, Cincinnati, Columbus, Ohio, Northern Kentucky area.